Do you wish you had a complete list of the best core exercises? Are you tired of doing sit-ups all the time? Here are the top 17 ab exercises you will ever need to develop your midsection and get the six-pack you desire. In addition, I will rank each ab exercise based on difficulty. That way you can challenge yourself regardless of your experience level! If your abs are never sore from a core workout, it may be because of your form. You see, most people don’t pay attention to their technique whenever they are doing ab exercises. Fortunately, there is one simple technique that you can use to improve your form on just about every single ab exercise. And I’ll cover that technique in this chapter. You will not be getting the most out of your core training. This is what we call lordosis, or an anterior pelvic tilt. This happens when the muscles in the front of your hip are tight and pull your pelvis forward. Lordosis also causes the muscles in the back of your hips, as well as your abs, to become elongated and weakened. In other words, your abs and your glutes are inactivated. If you train your ab muscles using this posture, then you are wasting your time. This is what we call a posterior pelvic tilt. Your back is almost rounded, and you are creating a hollow position. In this position, your low back is stretched, and your pelvis returns to a neutral position. Your abs are already turned on! This is the exact position you want to be in whenever you are doing any core exercise. 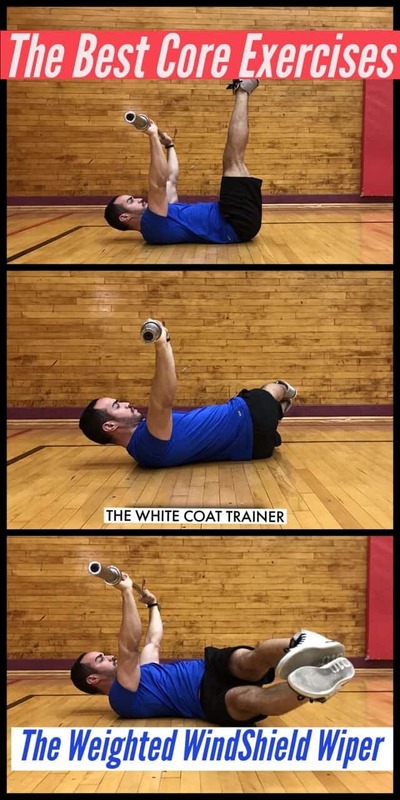 In general, there are three different types of core exercises you can perform. Now, I’ll go over how to use the posterior pelvic tilt in each of these three positions. Alright, now that you are an expert in tilting your pelvis posteriorly, it’s time to go over the different types of core exercises. Everyone assumes that sit-ups are the best way to train your core muscles. In fact, there have been numerous studies showing that sit-ups aren’t that good for you. Instead, you need to focus on 4 different types of core stability exercises to develop a strong and toned midsection. In this chapter, we will cover those 4 exercises in detail. That the main purpose of your core is to keep your spine stable? This means that your core muscles are meant to help you resist motion. Sure, there are many great core exercises that involve movement. But if you analyze those exercises closely, you will notice that the spine is relatively stable and resisting some type of motion in each of those exercises. The first core exercises that you should know about are the anti-extension core exercises. These exercises train the ability to resist extension/arching of the low back. This is the position that we are trying to avoid. The anti-extension movements are the most important core exercises. Letting your spine go into extension under load leads to compression and potential injury. Remember the whole posterior pelvic tilt we just discussed in chapter 1? That is what you need to do to make sure that you are training the anti-extension exercises correctly. 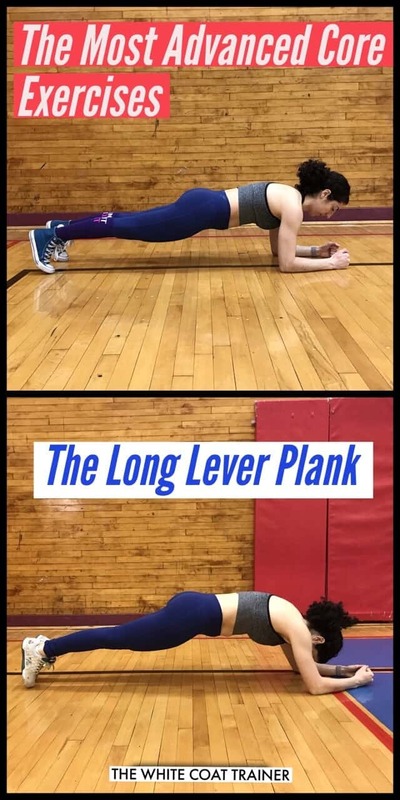 The most common anti-extension exercise is the plank. The next thing that your core needs to do is resist motion laterally. This is when you bend your spine sideways. The oblique muscles are responsible for allowing and preventing this movement. 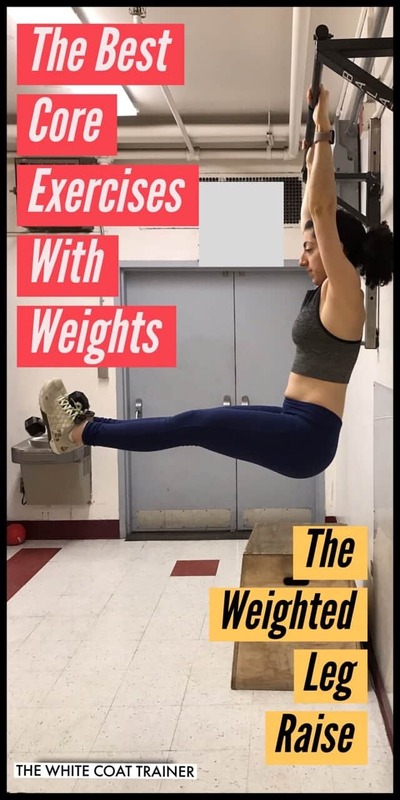 In general, this is not an exercise that you want to perform with weights. (Unfortunately, dumbbell side bends happen to be one of the most common exercises next to bicep curls). Instead, you should perform this exercise from a stable position. 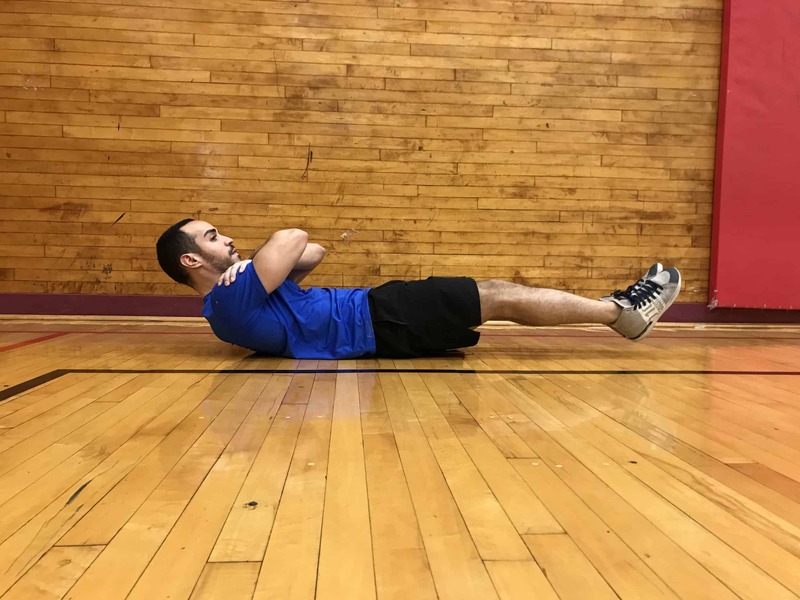 The most common anti-lateral flexion exercise is the side plank. This is when you rotate your spine while maintaining your hips in a neutral position. The oblique muscles are also responsible for rotation. In general, anti-rotation is the least important movement pattern. 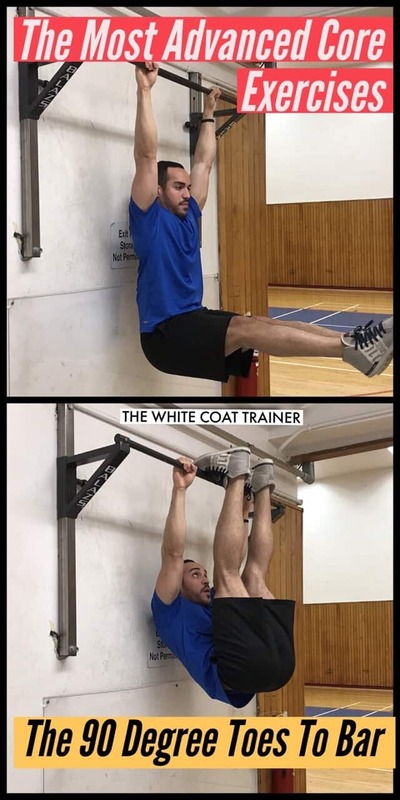 You don’t necessarily have to train it directly, as some of the core exercises listed in this guide will already train an element of anti-rotation. 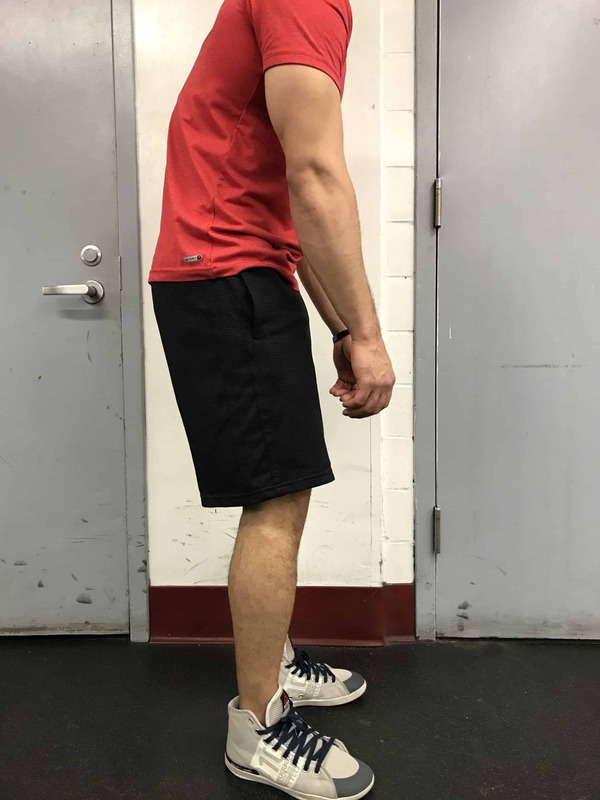 However, it is still important to pay attention to your technique, and actively avoid trunk rotation, even if you are performing an anti-extension exercise. A common anti-rotation exercise is the Pallof press on a cable machine. The anti-flexion core exercises involve movements that prevent your torso from rounding forward. In other words, you are trying to keep your spine neutral (or in a slight arch). This can only be achieved by using weights. The most common anti-flexion exercises are squats and deadlifts. In these exercises, the goal is to maintain a neutral spine against the load. These exercises fall beyond the scope of this guide and can be found in our weight training articles. So those are the four different stability patterns that you must be able to do. Again, this does not necessarily mean that your spine is not moving while performing certain core exercises. Instead, it means that your spine is resisting a particular motion during each exercise. We’ll explain with several examples in the following chapters. Now it’s time to move on to the actual exercises! 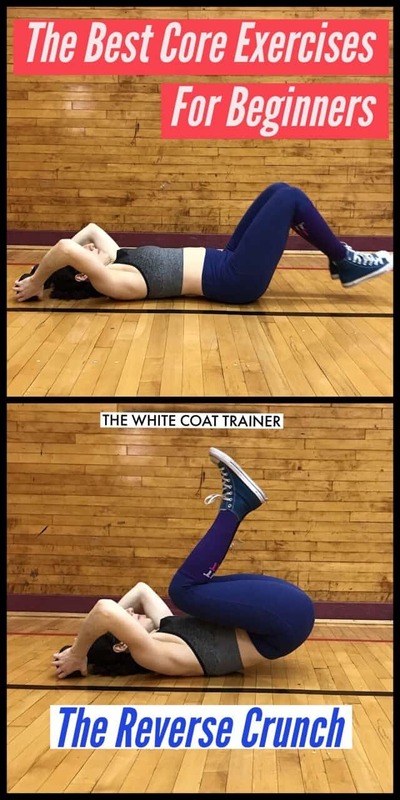 There are several different exercises that you can do to begin training your core. But as I’ve said before, some exercises are much better than others. In this chapter, we are going to go over the best core exercises for beginners. 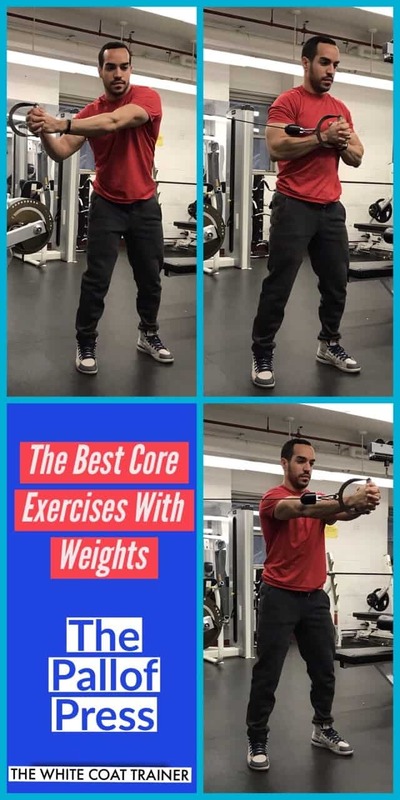 First up, is the most basic core exercise that you need to master. 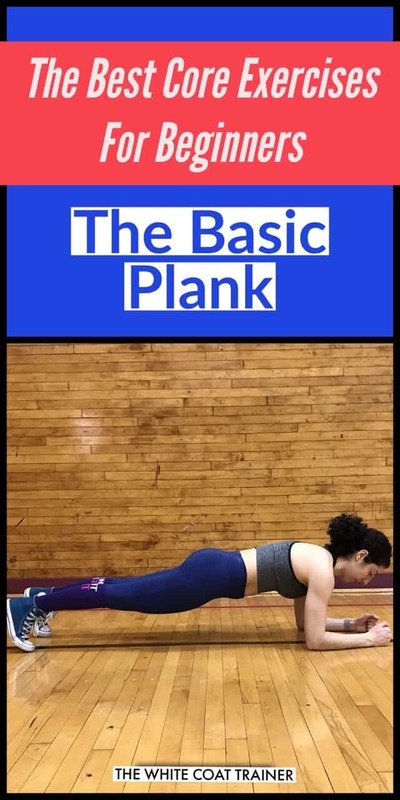 The plank is the most fundamental core exercise possible. You must keep your body in a nice hollow position without letting your low back arch. As you are performing it, keep your abs and your glutes tight the entire time. Do not let your hips sag. The second you get lazy, and your back arches in the slightest, the exercise is pointless. Once you can hold the plank for 3 sets of 30 seconds without losing form, you should increase the difficulty of the exercise. How To Increase The Difficulty: Raise your top leg into the air and balance yourself on one foot. 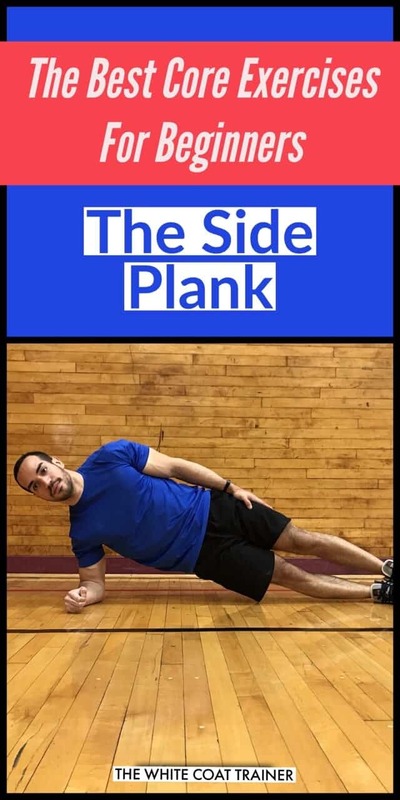 The side plank is a slightly harder variation of the standard plank. It places most of the weight on your oblique muscles and forces you to maintain total body tension. Make sure to keep your core and your glutes engaged, and do not let your spine flex or your hips sag. Hold this position for 10-20 seconds before moving on to a more difficult progression. The reverse crunch is a much better way of training your abs then the traditional crunch. Hold on to something sturdy behind you such as a dumbbell or a pole while you bring your knees towards your chest. At no point should your pelvis come out of the posterior tilt. Once you get comfortable with this exercise, straighten out your legs completely and repeat. To perform the quadruped knees to elbows, get into a push-up position and posteriorly tilt your pelvis. Draw one knee up towards your chest and try to make contact with the opposite elbow. Slowly extend the leg back and repeat with your other leg. Do not let your low back arch, and do not rotate excessively. The lying windshield wiper is a much better exercise than the Russian Twist. It is one of the best ways to develop your obliques and rotational strength for the more advanced exercises. In order to do this exercise correctly, lift your upper back off the floor to activate your upper abs. This will posteriorly tilt your pelvis and allow you to keep your low back completely flat on the floor. Go through this movement slowly, and control every aspect of it. So how many of these beginner core exercises can you do with perfect form? All of them, you say? Alright, so let’s move on to the intermediate core exercises. There is going to come a time where planks and leg raises will no longer be challenging for you. In order to continue strengthening and developing your six pack abs, you need to move on to harder progressions. 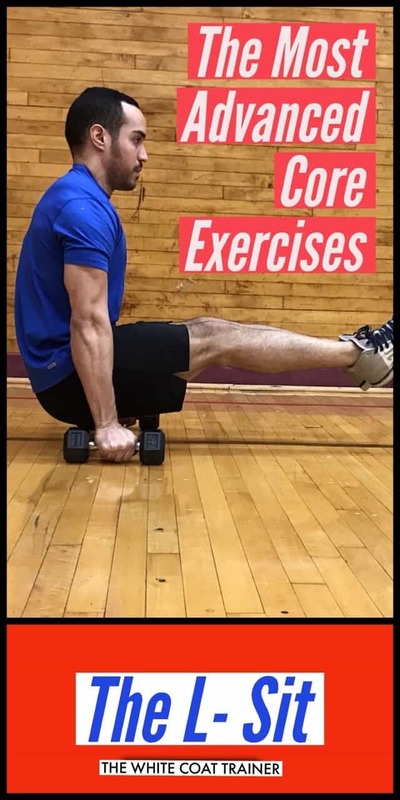 This chapter covers the intermediate level core exercises and introduces core exercises with weights. 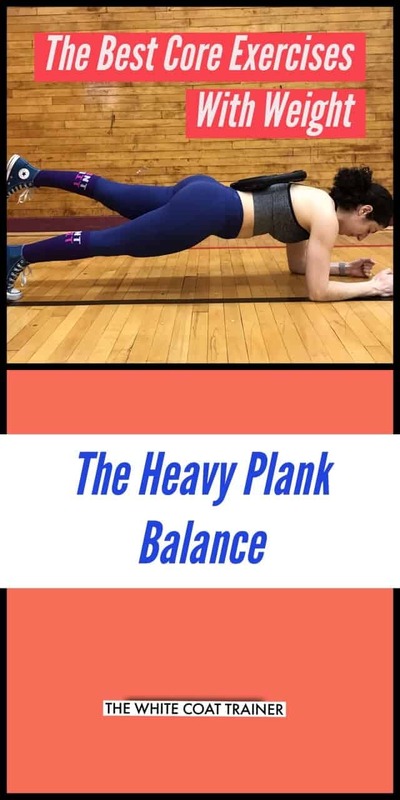 The heavy plank balance is a great intermediate exercise that adds two levels of difficulty. First, you have to balance yourself on just 3 limbs. Second, you have external resistance weighing you down. No matter what you do, do not let your low back arch, ever. Once you can perform this exercise for 20 seconds, go ahead and increase the weight! The loaded carry is a great exercise that combines core strength with everyday functionality. How many times have you carried uneven grocery bags or a child on one side? This exercise allows you to train that exact movement pattern in a controlled environment. 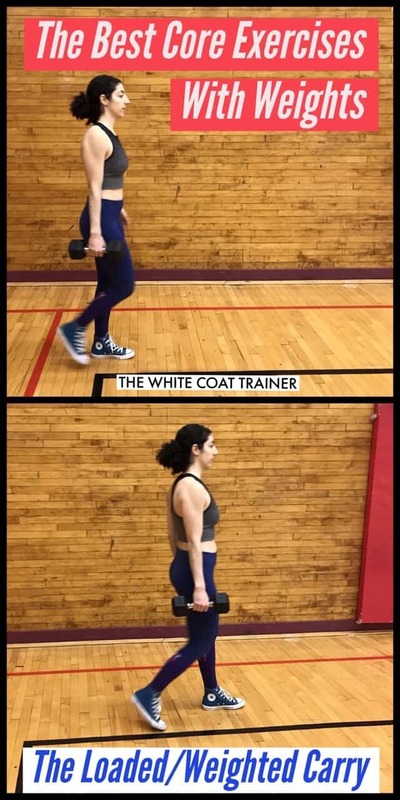 There are three different ways you can perform this exercise; the waiter carry, the rack carry and the suitcase carry. Do not let your spine bend laterally, and make sure to activate every core muscle possible. Try to make the exercise appear as if you weren’t carrying an uneven load. Once you can walk 40-50 yards with your chosen variation, increase the weight! 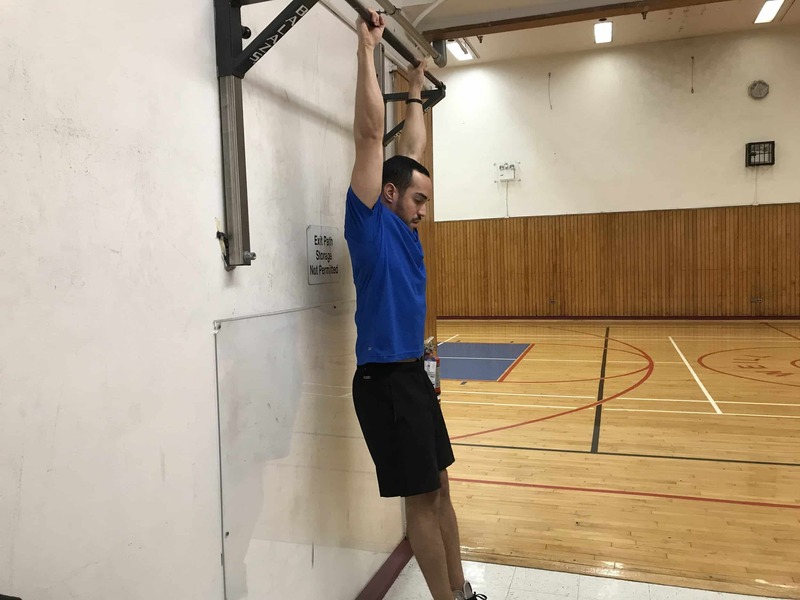 The Pallof press requires you to use either a cable pulley machine or a closed loop resistance band that is anchored to a pole and is set to chest height. Grab the handle or band and step away from the anchor point. From here, hold the handle/band up to your chest and turn your body perpendicular to the axis of the resistance. You should already feel the resistance trying to rotate you. Here comes the challenging part. Press the resistance directly in front of you by straightening out your arms completely. Resist the urge to let your spine rotate! Slowly bring the resistance back to your chest and repeat. How To Increase The Difficulty: Bring your legs all the way up and perform the toes to bar (in this variation use ankle weights instead). Now you are ready to do the leg raise from a hang position. The hang position drastically increases the demands of this exercise as you are forced to rely on your core to not swing all over the place. Point your toes, posteriorly tilt your pelvis and control your legs on the way up, and especially on the way down! Do not let your legs go behind your body, otherwise, you slip into spinal extension. To make this exercise more difficult, hold a light dumbbell in between your feet. The dumbbell will make you want to swing your legs back and forth, but you are better than that. Control your legs on both the way up and the way down. This exercise becomes much more challenging with straight legs and an external load to balance. To do this exercise, raise a barbell or two dumbbells directly above you while lying on the ground. Lift your upper back off the floor to keep your upper abs on tension, and create a posterior pelvic tilt. From here, straighten out your legs and begin wiping those windshields. Make sure to start with light weights. 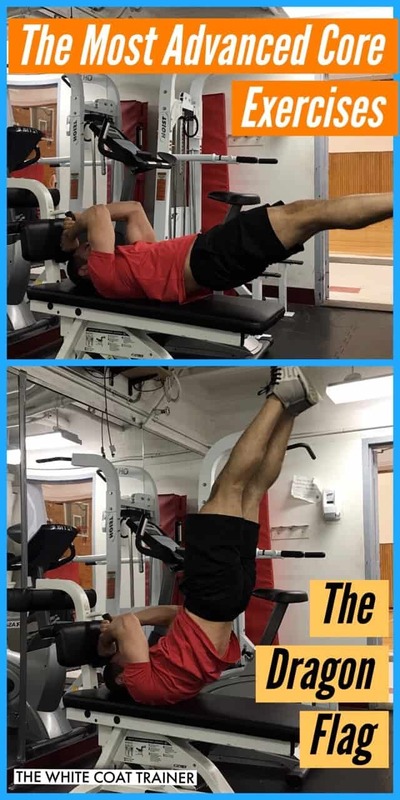 It is also a good idea to perform this exercise with some kind of spotter or rack for your safety. This exercise is tough. In order to do it properly, posteriorly rotate your pelvis and flatten your low back against the floor completely. From here, raise your upper back off the floor to keep your upper abs on tension. Next, grab a small medicine ball and hold it in between your feet. Finally, lift your legs off the ground and point your toes. Ok, those exercises were tough right? If you are serious about core training, you will eventually reach the advanced stage. Below you will find the most difficult ab exercises ever. If you are able to perform these, you will have some cool pictures and videos to post on your Instagram. So, how many can you do? *Do not try these exercises unless you have sufficiently trained for them, otherwise serious injury can result. How can we possibly keep making the plank more challenging? 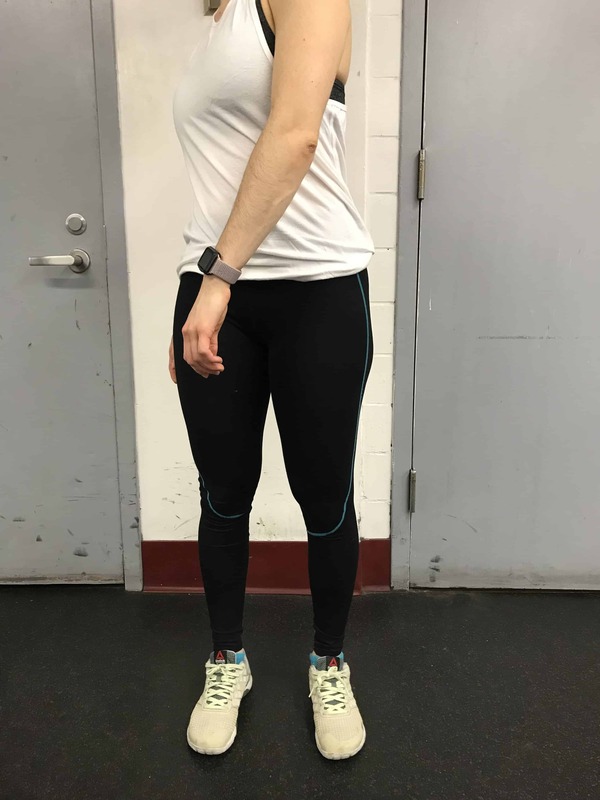 By extending your arms more in front of you. Start by placing your elbows by your ears. Give it a try. Oh, and while you’re at it, add some weight on to your back. You must keep your back slightly rounded and your pelvis posteriorly tilted. If your low back arches for even a second, you must stop the exercise. The L-sit is an advanced core exercise that requires abdominal strength, hip flexor strength and hamstring mobility. 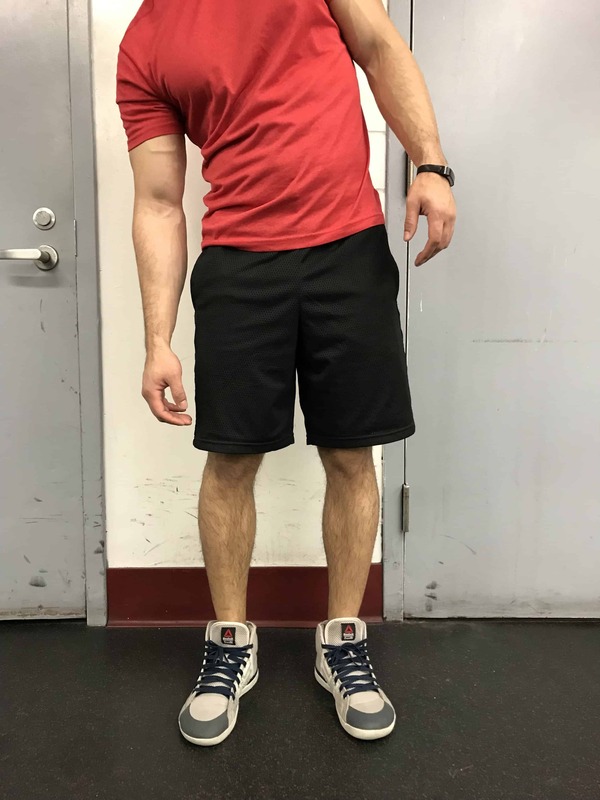 You can perform this exercise on dip bars, or on small paralletes. I prefer you to use the paralletes as you cannot cheat in this version. If you do not have paralletes, a pair of 5 lb dumbbells should suffice (obviously they have to be the hexagonal dumbbells and not the round ones). Sit in between the paralletes with your legs straight and brace your core. From here, push down hard to elevate your entire body. Your body will naturally achieve a posterior pelvic tilt. Once your feet touch the ground, the set is over. To make this exercise more challenging, do it on the floor without any paralletes. How To Train It: Work up to 15 solid reps, then increase the difficulty. The ab wheel rollout is a classic exercise. From the get-go, grab the ab wheel and assume a rounded upper body position. Slowly roll forward until your face nearly touches the floor. Do not allow your back angle to change as you roll the wheel forward. If your low back arches even the slightest, then you have defeated the purpose of the entire exercise. What makes this exercise so great are the numerous variations. You can easily throw on a weight vest to make this exercise harder, or you can work your way up to a complete standing ab wheel rollout. The standing rollout is a 5/5 in terms of difficulty. I still haven’t mastered the standing ab wheel rollout. You have probably already seen me talk about the traditional toes to bar exercise. In that variation, you bring your legs all the way up to touch the bar while in a hanging position, then bring them all the way back down. In the 90 degree toes to bar, you will not bring your legs all the way back down. Instead, you will stop at 90 degrees, in an L-Sit, then go back up. Your abs will always be on tension, and this exercise is challenging! To make this exercise even more challenging, add some external resistance in the form of ankle weights. The hanging windshield wiper is the toughest rotational core exercise you can do. It requires the core strength of the toes to bar exercise and a high degree of rotational strength. To do it, raise your legs up as if you are doing the toes to bar exercise. Once your legs reach the end range, slowly begin rotating your legs to either side. It is extremely important that you maintain control throughout this exercise. Do not let yourself rotate too far in either direction. Also, you may need to lean back some in order to do this exercise effectively. Keep in mind though that the more you lean back, the more your lats have to work to keep you in the proper position. The dragon flag is by far one of the coolest exercises you can do. Do not attempt this exercise unless you deem yourself to have elite level core strength. In order to do this exercise, you will need a bench or a pole that you can grab onto. 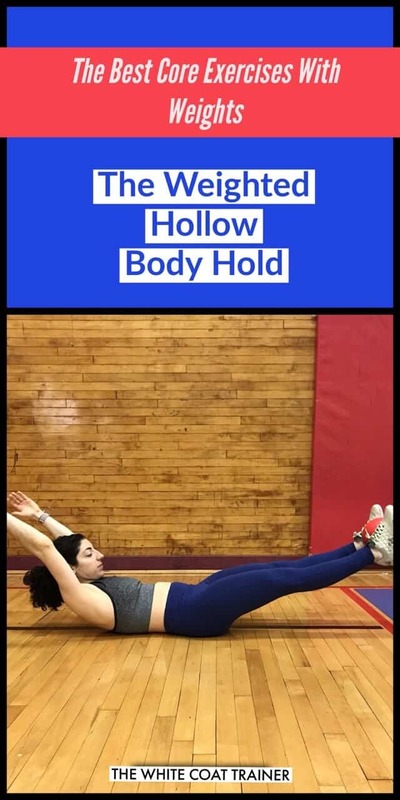 Lay on your back and grab the supporting structure behind you above your head. From here, point your toes and begin raising your legs towards the sky. Do not let your knees bend nor your hips bend. Your body has to be in a completely straight line. Once you reach the top, slowly lower yourself back down without letting your legs or your hips touch the floor. This exercise is really challenging. You may only be able to get 1 or 2 reps at first. Alright, so that just about wraps up the 17 best core exercises for beginners, intermediates and advanced athletes. 80% of you will develop back pain at some point in your lives. 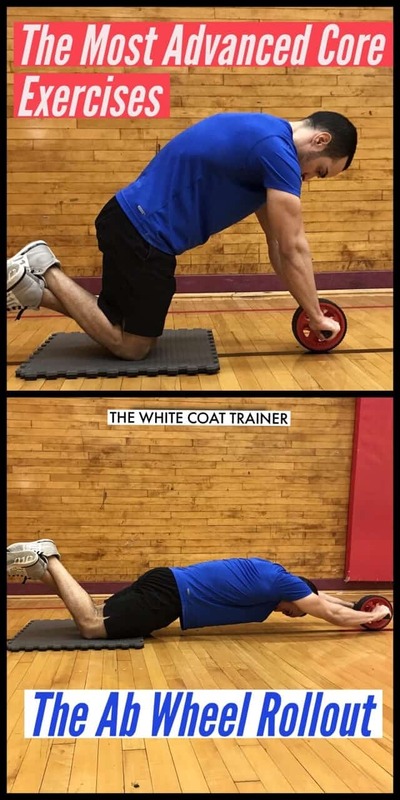 I also want to cover a few core exercises you can do for back pain. If you have low back pain, it may be because of your posture and a weak core. Whenever you sit too much, the muscles in your hips can become tight and pull your pelvis out of normal alignment. 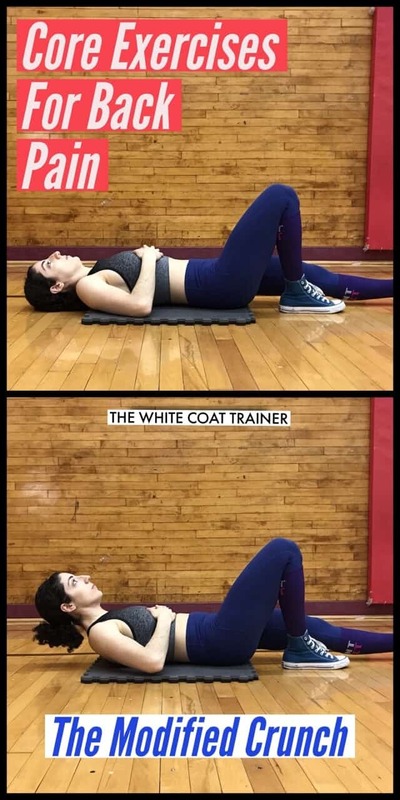 Fortunately, there are some simple exercises you can do to improve your pelvic alignment and restore strength around your core musculature. In this chapter, I will cover the best core exercises for back pain. A lot of what I learned was through Stuart McGill, a world-renowned expert on back pain. The cat-cow is a great exercise you can perform if you have back pain. This exercise teaches you how to flex and extend your spine in a stable unloaded position. This is important as you need to be able to move the muscles around your spine to allow for improved blood flow. Simply rotate between a flexed, hollow body spine, to an arched, extended spine position. Inhale as you extend, and exhale as you flex. Take your time through this exercise and make sure that you do not extend your neck excessively. The bird dog is one of the most fundamental exercises to teach you core stability. From a quadruped position, begin by extending one leg behind you, and the opposite arm in front of you. Hold this position for a 3-5 count while squeezing your abs and the glute muscles. How To Train It: Work up to 3 sets of 8 repetitions on each side. The dead bug is another simple exercise you can do to train your core muscles under zero load. Lay on your back with your knees bent towards your chest and your arms extended in front of you. Posteriorly tilt your pelvis. From here, you will do the same movement as a bird dog. Straighten one leg out while lowering your foot towards the ground while extending the opposite arm overhead. Take your time and hold the bottom position for a 3 count before returning back to the starting position. The modified crunch is one of the safest ways for you to train your upper abs without placing stress on your spine. To do it correctly, you will lay on your back while posteriorly tilting your pelvis. You can even bend one knee to ensure that your low back remains in contact with the floor at all times. Then you are going to lift only your upper back off the floor just enough to feel the tension in the upper abs. Hold this position for a 5 count before returning to the starting position. The lying knee drop is similar to the dead bug exercise. Start by bringing your knees to your chest and slowly lowering and extending one leg at a time. Hold for a 3 count and return that leg to the starting position before extending your other leg. It should go without saying that if any of these exercise causes you pain, you should not perform them. Be sure to seek consultation with an appropriate medical provider whenever necessary. Ok, so that wraps up this chapter. There is only one more thing we need to cover. How to schedule your core training so that you can get the six pack you desire! Now that you know the best core exercises, it’s time to put them to use. A lot of people train their abs every day, for hundreds of repetitions. You aren’t going to do that. In this final chapter, we are going to give you the best guidelines for training your midsection. Let’s start by addressing a few questions. Can I Do Core Exercises Every Day? You can do whatever you want, but I don’t recommend that you train abs every day. Your abs are muscles just like every other muscle. Do you perform the bench press or the deadlift every day? I didn’t think so. It is ideal to train core exercises two to three times a week. 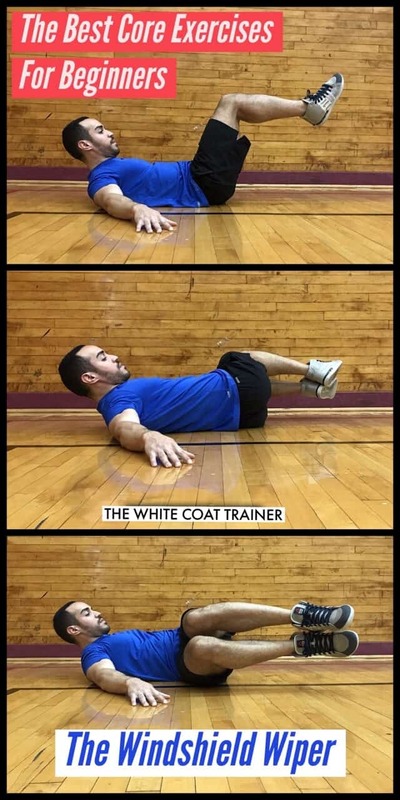 This will give you enough time to allow appropriate recovery of your ab muscles. If you can do core every day, then you probably aren’t training it appropriately. How Can I Improve My Core Stability? You can improve your core stability by training the four key core stabilization exercises. These are the anti-extension exercises, anti-lateral flexion exercises, anti-rotational exercises, and anti-flexion exercises. The ones that will improve your core stability the most are the isometric or static variations. This includes exercises such as the plank, the side plank, the hollow body hold and, the L-Sit. Not only are these the best core exercises for stability, but these are also the best core exercises for strength. It is important to incorporate both static and dynamic variations of core exercises into your training. Can Everyone Get A Six-Pack? Everyone already has a six-pack. The amount of body fat you carry is what determines whether or not you will be able to see them. The only way to actually see your six-pack is to achieve body fat percentages of 15% or lower. You can do all the core exercises you want, you will never see your abs if you carry a lot of extra mass. 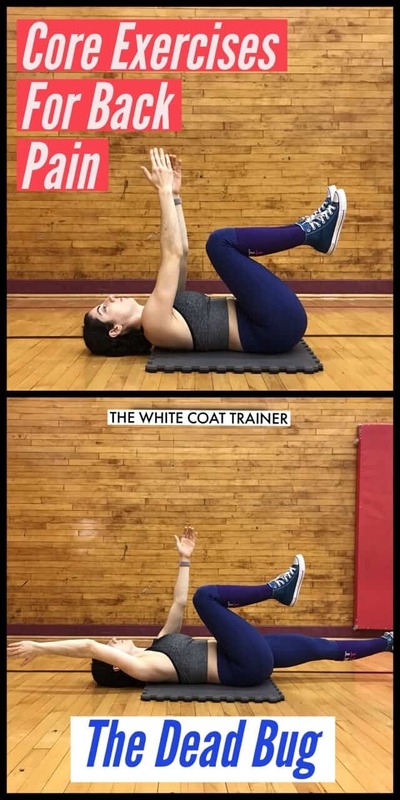 What About The Core Exercises For Women? Women do not need any different core exercises than men. All of the above exercises are perfect for both men and women. However, if you do not want your obliques to get bigger, then avoid performing the windshield wiper exercises. What About Core Exercises At Home? 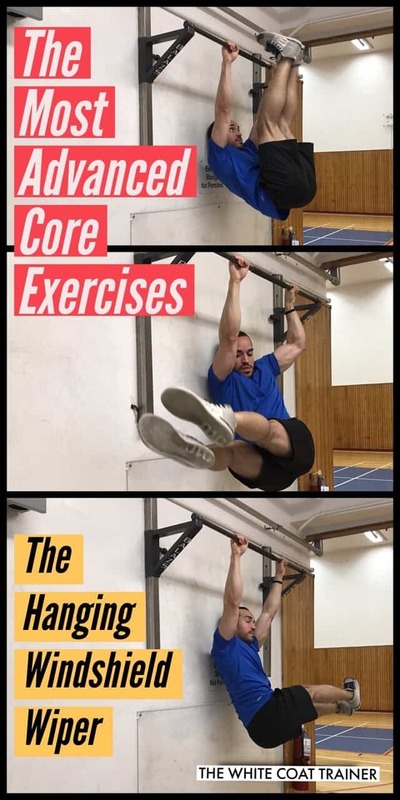 You can do just about every single core exercise in this guide at home, provided you have access to a pull-up bar and some external resistance. In fact, we have written a massive post on all the best exercises you can do at home. We have also created a ready-made exercise template that can be done in as little as 20 minutes a day from the comfort of your own home. 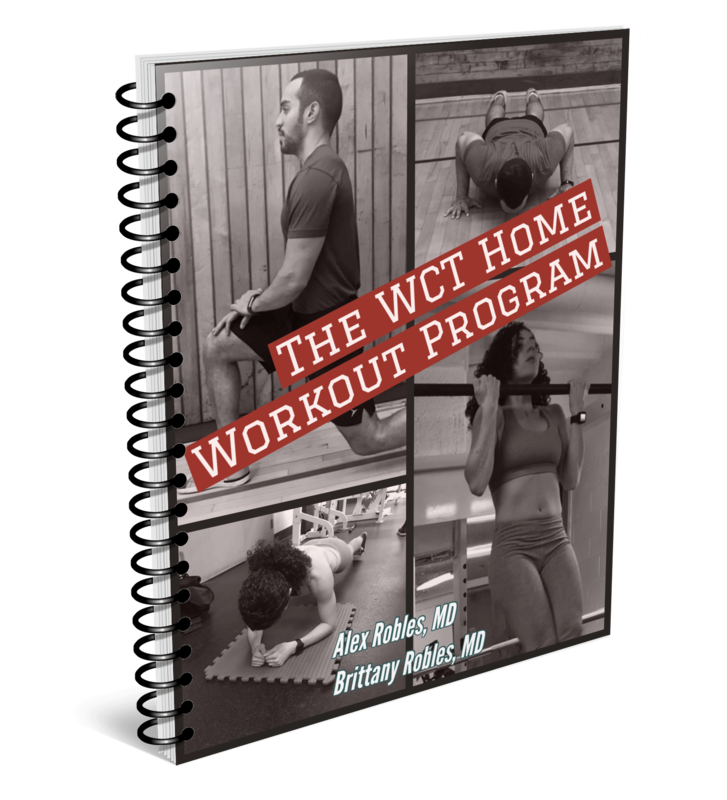 Check it out at the WCT Home Workout Program. It includes a few of the core exercises listed above, as well as progressions and regression for each exercise. To learn more, check it out in our Products Page. So that’s how to get a six pack without doing sit-ups. Now I want to turn it over to you. What did you think about this guide? Or maybe there’s something I missed. 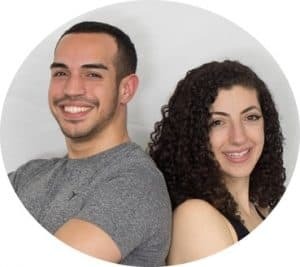 And be sure to join our community to keep getting articles like this one, and when you do, you’ll receive a copy of our workout template for busy professionals. Great article. Props to anyone who can do proper standing ab wheels or V-Sits. What are your thoughts on doing supermans for strengthening the lower back? I do them regularly and like them but wonder if it might make my anterior tilt worse. Thanks Grant.I know right. They look way easier than they are.I think supermans are a good choice for strengthening the low back, but I would be wary of them if 1) you have low back pain or 2) anterior tilt just as you said.I prefer to use exercises that keep your low back in a more neutral position through isometric strengthening, such as the back raise, goodmornings, RDL’s etc.